This story begins in my high-school chemistry class. That's the place I designed my first model. It was just a sketch on some graph paper, but along with the odd looks from my classmates, it brought out a passion that survives within me today. No, I did not do very well in chemistry. 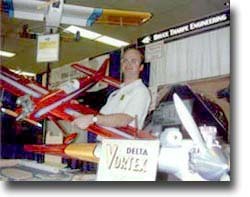 Thanks to my father, I had been a modeler for years, but the creative juices were inspired by another person; Burt Rutan. In those years, Rutan was bursting upon the scene with one amazing design after another. When I graduated with an Aeronautics degree from San Jose State University, I wanted to be the next Burt Rutan. Instead of looking towards the major corporations like most of my fellow grads, my interest was in the smaller industry of homebuilt aircraft. I soon began working for Morrisey Aircraft Corp. in Las Vegas, Nevada. Morrisey was just getting started making kits for its only airplane, the Morrisey Bravo. Having earned my Private Pilot license in high school, I was fortunate to fly the Bravo several times. It was a stylish two-seater that a year earlier, at Oshkosh, had caught the eye of world-class scale modeler Claude McCullough. 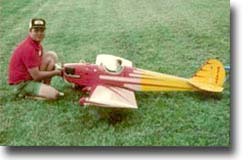 Claude designed a quarter-scale model of the Bravo and Sig manufactured the kit. While still working for Morrisey, I wrote a product review on the Sig kit for Model Builder Magazine. Shortly after that, the one and only full-scale Bravo was purchased from Morrisey by that famous Iowa couple, Hazel Sig and Maxey Hester. When they came to Las Vegas to pick up the airplane, we had a friendly lunch together. A few months later, I was moving to Montezuma to work for Sig Manufacturing. My years at Sig were fantastic. While there, I designed five kits: the 1/3-scale Spacewalker, the Four-Star 40 and 120, the Mid-Star 40, and the Wonder. I worked there for eight years, made lots of friends, and hated to leave, but there was still a passion burning within. I wanted to be in the model airplane business and I wanted to do it on my own. Bruce Tharpe Engineering was established in 1994 in the garage at my father's house in Rogue River, Oregon. Working around his speedboat and motorcycle, I developed the Venture 60, made a hundred kits, placed some ads, and waited by the phone. Finally it rang, and the kits slowly started going out the door. What a feeling! Maybe I'm a throwback, but to me there is something fundamentally "right" about creating a product, manufacturing it, and selling it yourself. A couple of years later, BTE moved to its current location in Wimer, a rural community about eight miles outside Rogue River. The Flyin' King made its debut followed by the Delta Vortex a few years after that. BTE designs can now be seen flying at fields not only in the U.S. but around the world. The success of these three kits has kept me so busy that finding time to develop new designs is difficult. That's not a complaint! For all intents and purposes, BTE is a one-man shop. I sort the wood, cut all the parts, pack the kits, and sweep the floor. Family and friends pitch in from time to time and their help is always greatly appreciated. For the record, I'm a divorced dad with two fantastic kids who are my only other true passion. Many people ask if I have a "regular" job. Nope, BTE is my livelihood. I put all my effort into my kits and lots of builders have said that it shows. My simple reply is that I'm just trying to make kits the way I'd like to receive them if I were the customer. If you happen to be passing through the beautiful Rogue Valley in Southern Oregon and would like to visit BTE, be sure to give me a call. That way, you'll know for sure that I'm there and I can give you directions to the "factory". Visitors are always welcome. If you can't make it out this way, maybe our paths will cross at one of the big trade shows or flying events. 'Til then, enjoy the hobby, fly safe, and keep building! 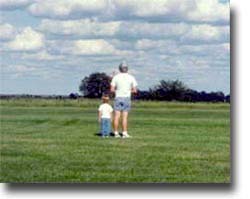 Bruce and son, Brandon, enjoying a typical afternoon at the Sig field in Montezuma, Iowa. The 1/3-scale Spacewalker was Bruce's first design project for Sig. He competed at Top Gun and Scalemasters with this model in the early 1990s. Here's Bruce packing Delta Vortex kits. 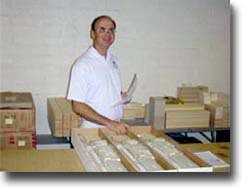 Every piece of wood that goes into a kit box is handled and inspected by Bruce, one of the benefits of buying from a small company like BTE. The BTE booth at the Northwest R/C Expo in Puyallup, WA. Bruce usually mans a booth at most of the major trade shows around the country.